← Time: why can’t it ever be just right? Our lives are getting ready to change in a huge way. Since you are so little, only 14 months old, I haven’t really found a good way to share with you just exactly what is getting ready to happen. Your daddy and I talked about getting a baby doll to carry around to show you how to be nice to a baby – just like we’ve had to teach you now to “pet Winnie nice”. But, we never did get a doll. That’s okay because you haven’t seemed to notice mommy’s ever growing tummy or swollen ankles, and that is apparent by the way you launch yourself onto me after waking up from our (almost) daily naps. You haven’t given us too many weird looks when we’ve spoken of this “Nellie” character who will be making her way into the world any day now. You certainly haven’t slowed down or held back when it’s come down to the things you’re learning, like walking and running, and being incredibly active. You also haven’t stopped wanting me to hold you, hug you, read to you, pick you up, or sing to you. We have a special relationship, you and I. And tonight as I was watching you fall asleep in my arms, I realized that our relationship is heading into a new season – a season that I’m not certain how either of us will handle. Since I’m uncertain about what the future with another little baby is going to look like for you and me, I want to make sure that you know exactly how I feel about you and our relationship right now. Jakob Maurice Wingler, you, my sweet baby boy, are my firstborn and will always be. You were the little seedling who grew in my tummy for 39 weeks and made me a mommy for the first time. You changed my heart in a way that I never would have experienced before becoming your mommy. It is because of you that I know that I can love Nellie, too, and be a decent mom to her. It was you, little boy, who made me sick for the first 17 weeks of your pregnancy and who kicked around in my tummy every night until the evening you were born. It was you who I fell in love with instantaneously as soon as your daddy and I knew about you. And the moment I saw your sweet face for the first time was a moment that forever changed me. I don’t remember ever being more excited, relieved, overwhelmed, and emotional as I was at the moment you emerged from me. Our first few weeks together are kind of blurry because of the lack of sleep, but I do remember telling your daddy that I felt like it was Christmas morning all of the time when I woke up to you! You were real. You were warm and cuddly. You were right next to me. You needed me to give you everything, and I loved (and still love) you fiercely. You were the babe who helped me hone my mommy instincts that, I swear, are incredibly right on when it comes to you. I breastfed you for the first 6.5 months of your life until my pregnancy took a toll on my milk supply. When I couldn’t breastfeed you anymore, I was devastated. I was not prepared for another life growing inside of me to take the nourishment that I was giving to you. But, little man, after some ups and downs, we settled on a new routine of formula, and you did just fine. In fact, you’ve done just fine in every area of your life thus far. 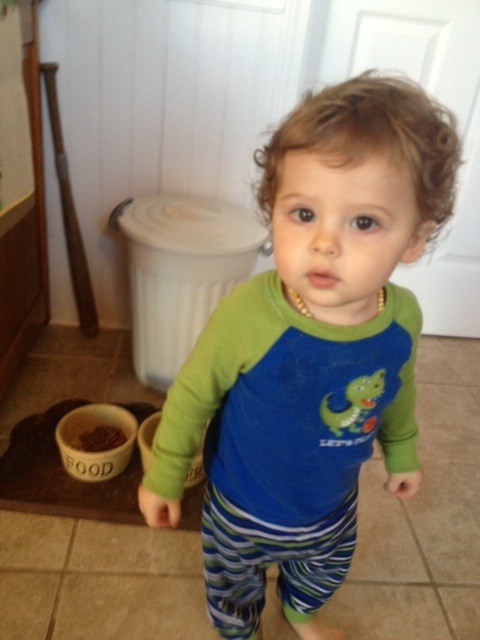 You are an amazing little boy who is curious, active, silly and funny, tenacious, vibrant, and sweet. You have given me innumerable moments of joy and delight. You have also been the source of some stress and frustration, like when you wouldn’t sleep for the first nine months of your life or when you couldn’t be put down for more than a moment without crying out for me to come get you. It’s been hard for me at times to remember that you are only this little once. As I was rocking you to sleep tonight, something that has actually been awesome lately because you are putting yourself to sleep at night, I felt a bit panicked because I realized that the days of you as an infant are through. You are a toddler now. You are a big boy. While you need me some, the days of you needing me for every single need and desire are slowly going away. I want you to know that when Nellie comes, you’ll probably find even more time to be independent, because mommy will have to spend a lot of time focusing on her the way I focused on you. Please know that my love for you is not fading, and you are not less important to me in any way. Our time together will just be a little different. I pray that you learn to love Nellie in time. I know that for awhile you won’t understand what is going on and why mommy is holding a little baby so much. I promise you, Jake, that my arms will always be open for you. There will always be enough room in my arms for you. We may have to do some baby-juggling, but I will never let you feel ignored. You, Nellie, and I are going to have some adjustments to handle, for sure, but I’m certain that my overwhelming love for you both will make this time of transition as comfortable as possible. Plus, you’re going to have your daddy and baby sister (as we call KT), to show you extra love and attention until we’re all settled into the new routine. So, as we move into our new phase, please always remember how much I love you and how you will always and forever be my first baby love. Always. My sweet baby is growing up! My husband wrote a book!! Time: why can’t it ever be just right?